I didn’t mean to be a preacher. At least not that young. I had just turned 21; returning from a summer spent in the Philippine Islands serving, as it was called at the time, as a “summer missionary.” Fall semester was about to begin at college and I was one of a handful of early arrivals. My faculty advisor saw me chatting it up with some friends in the student center and walked over my way. I assumed he wanted to ask me about my summer on the mission field, or remind me to set an appointment with him to discuss classes. Instead he came right out and asked had I ever given any thought to being a preacher. Yeah, I thought to myself, when I get old. He said that there was this little country church just north of Rome that needed a preacher for Sunday mornings. There was not much more to the job than Sunday sermons and it would be good experience. The pay was $75 a week. I did not think to ask about benefits. Since I had nothing better to do, and waiting tables that fall did not seem very exciting, I thought why not. I had plans to go to seminary after college, preparing for a ministerial vocation, but I had no clue what exactly that would look like. Every Sunday except for fifth Sundays I pulled into the graveled church yard leading to a simple wooden frame church building, tucked away in a thicket of oaks, hickories and pines in the hill country of Northwest Georgia. During the summer time the windows were wide open, allowing welcome breezes to come in, as well as wasps, butterflies and, on one occasion, a brown thrasher. I only had one suit and it was not a real one. The coat did not match the trousers, but it was on sale at Sears and I was proud of it. My Bible was one I bought for my time in the Philippines. That was exactly 30 years and several pastorates ago. Now I guess I am old enough to be a preacher. It was just three or four years go this same church decided it was time to close the doors for good. People just don’t go to country churches anymore and the remaining membership felt like it was as good a time as any to move on to the next season. 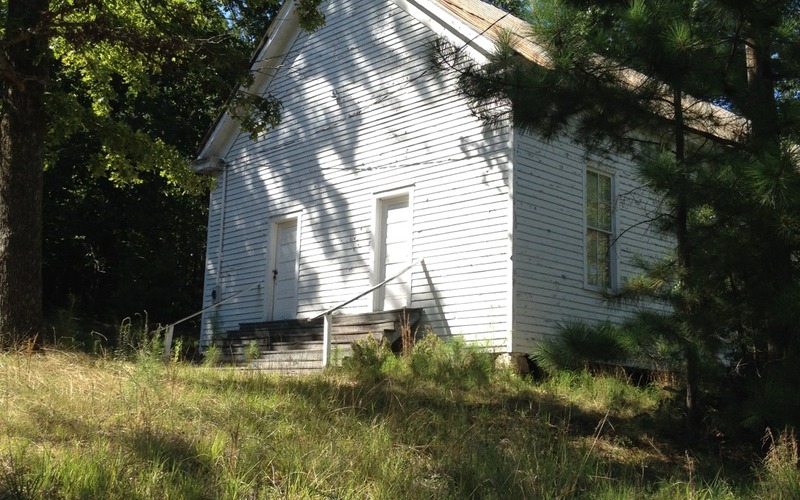 The church building, a simple wooden structure with two doors in the front – hearkening back to an era when men and women entered on separate sides – was donated to the volunteer fire department. A few weeks ago the little church house was finally burned to the ground, giving its very timbers to firefighters who needed the practice. It was a cremation for a church house, but without much ceremony. It takes me a bit sad to think that this church no longer meets on Sundays and this sweet old white frame building no longer stands as a monument that it ever existed. Who will know that it ever was? And yet the church does live on through the generations who have come and gone; who have made their mark; and some still making their mark on this world. Every Sunday that I stand behind a pulpit and open up my Bible to say more than a few words I carry a bit of Unity with me, surrounded by a great cloud of witnesses that still encourage me. It was called Unity and although there is no longer a place that brings the people together, the church continues in a very unified mission, entwined in God’s magnanimous love. I learned much in the years since serving Unity. They blessed me onward when I moved away to seminary. They kept track of the other churches I would go on to serve as pastor; churches much larger and complex than that simple country church. I still wear a suit on Sunday morning, but I make sure the trousers match the coat. The ensuing decades have made me older and a bit more experienced. I can look back and say with deep conviction that Unity taught me everything I needed to know about serving this world as a minister of the gospel: to love God and love others. A simple church with a simple message. Nothing remains of this church except for a patch of scorched earth and piles of ashen debris. Yet everything that really matters lives on, and will carry-on. Love will not be kept. I am a grateful, former pastor, of this little church in the wildwood. Love will not be kept.